Many authors employ a tried-and-true formula for young adult novels with a female protagonist: girl is displaced for a period of time to live with a relative or parental figure from whom they feel disconnected, girl meets love interest, and adventure ensues. 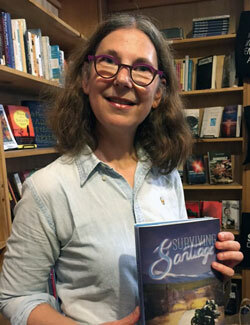 Lyn Miller-Lachmann’s Surviving Santiago, the sequel to her first novel Gringolandia, meets these expectations with the inclusion of some of these tropes: the displacement to another country, the disconnected parent, the dangerous love interest and the naïve teenage girl, but the novel partially subverts this formula. It explores complicated relationships and the self-empowerment that occurs when one accepts people for who they are. On an outing in town, Tina meets and connects with a young, handsome courier, Frankie. They bond over their love of Metallica and their shared experiences with alcoholic fathers. The more Marcelo protests their relationship, the more connected she feels to Frankie. When the political climate in Santiago heats up, Tina begins to wonder if people around her are withholding information and if Frankie is who he claims. The physical descriptions of Santiago acclimate the reader to the uncertain economic and political climate of the time and emphasize Tina’s feelings of displacement. The Santiago Tina knows has changed, and, while it seems safer, Tina is unsure how to act in her native country. She feels like a stranger. As the repression of the Pinochet dictatorship weakens, the author introduces the changing political landscape through the descriptions of the graffiti in the neighborhood where Tina’s father lives: “The graffiti in black on the walls reads ‘nunca mas’-never again.” And the city center places Tina in a world of changing economic progress. Some sections of the city represent the capitalist progress with “wide avenues” and “high-rises with plate-glass windows.” Others represent the poverty that still occurs. To add to the feeling of uncertainty, Tina constantly describes the thick smog of Santiago, which obscures her view of the city and makes it hard to breathe. It is through this descriptive landscape that we understand Tina’s view of the city and how she sees herself in it. 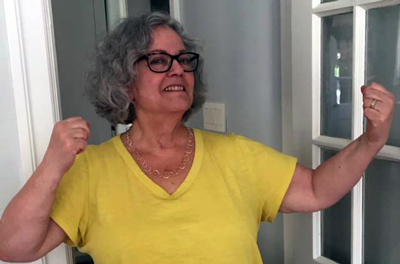 While the author seeks to tackle an important time in Chilean history, Tina’s development and personality appear disjointed, largely focused on her relationship with her father and Frankie. Despite espousing ideas of feminism to the men in her life, she lacks any interests beyond superficial ones: music, smoking weed, and spending time with Frankie. While these are real concerns for the average teenage girl, it is disappointing to see her first person narrative voice linger on the sidelines. 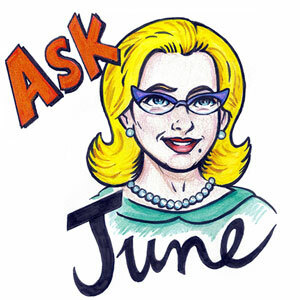 Tina is a passive observer of the action rather than a young woman engaging in the development of her personal identity. It isn’t until the end of the novel, when the dangerous stakes of her father’s political activities rise to a breaking point, that her voice matures. But it begs the question of what could have been if Miller-Lachmann focused more on the full development of her protagonist from a displaced immigrant’s perspective rather than the historical accuracies after her time spent in Chile in the 1980’s. The most convincing point of development for Tina is her mingled disgust and pity for her father during his drunken stupors. She begins to feel empathy for his pain and wonders about the tortures he must have endured in prison. Despite how much she reviles his drinking, she doesn’t want him to die and hopes that he will be able to heal himself. Tina’s voice develops over the course of the novel from apathetic and naïve about the things that are happening around her to fiercely protective of herself and her father. In this historical novel set against the backdrop of a country attempting to heal from political turmoil in a fledgling democracy, Surviving Santiago is a story about a young woman’s relentless hope for the best in others despite their shortcomings. It is a novel about letting go of old hopes in order to form new relationships and remake new lives. By the end, Tina admits that, while she is in Santiago, she and her father must be “the way we are now and not the way we used to be.” Tina discovers that there is always more than one side to someone, and that the only way to fully heal is to accept things as they are instead of dwelling on what could have been.